The Waterman Aerobile at the Smithsonian. A flying car or roadable aircraft is a vehicle which can travel on roads and in the air. It is both an aircraft and an automobile. All the working examples have required some manual or automated process of conversion between the two modes of operation. A slightly different concept that is sometimes referred to as a "flying car", particularly in science fiction, is that of an aircraft that would be practical enough for every day travel, but would not necessarily be drivable on the roads. Glenn Curtiss, the Wrights' chief rival, was the first to design a flying car. The first flying car to actually fly was built by Waldo Waterman. Waterman became associated with Curtiss while Curtiss was pioneering naval aviation at North Island on San Diego Bay in the 1910s. 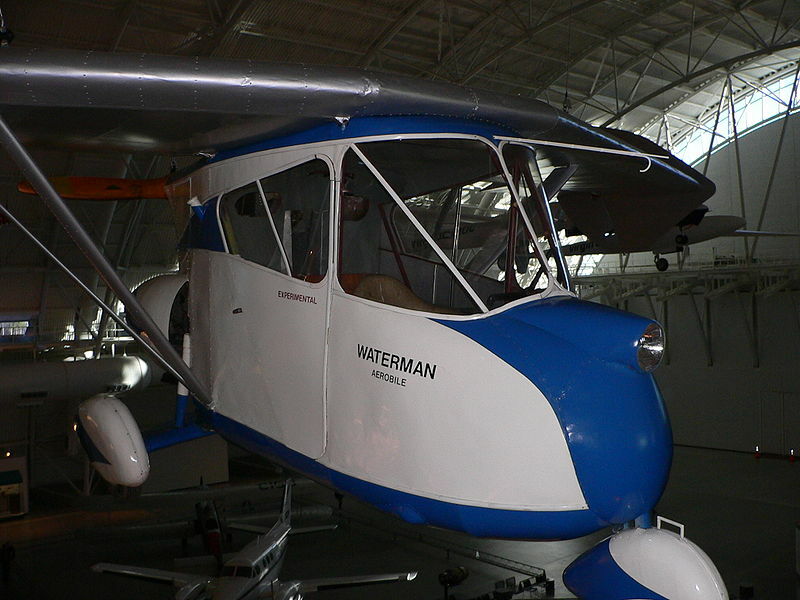 However, it was not until March 21, 1937 that Waterman's Aerobile first took to the air. The Aerobile was a development of Waterman's tailless aircraft, the Whatsit. It had a wingspan of 38 feet (11 m) and a length of 20 feet 6 inches (6.25 m). On the ground and in the air it was powered by a Studebaker engine. It could fly at 112 mph (180 km/h) and drive at 56 mph (90 km/h). In 1926, Henry Ford displayed an experimental single-seat aeroplane that he called the "sky flivver". The project was abandoned two years later when a test flight crashed, killing the pilot. In the 1950s, the western world was recovering from World War II and everything seemed possible. The flying car was a vision of transportation in the 21st century, and a common feature of science fiction futures. Several designs (such as the Convair flying car) have flown, none have enjoyed commercial success and those that have flown are not widely known about by the general public. The most successful example, in that several were made and one is still flying, is the 1949 Taylor Aerocar. One notable design, Henry Smolinski's Mizar, made by mating the rear end of a Cessna Skymaster with a Ford Pinto, disintegrated during test flights, killing Smolinski and the pilot. In the 1950s, Ford Motor Company performed a serious feasibility study for a flying car product. They concluded that such a product was technically feasible, economically manufacturable, and had significant realistic markets. The markets explored included ambulance services, police and emergency services, military uses, and initially, luxury transportation. Some of these markets are now served by light helicopters. However, the flying car explored by Ford should have been at least fiftyfold less expensive. When Ford approached the U.S. Federal Aviation Administration (FAA) about regulatory issues, the critical problem was that the (then) known forms of air traffic control were inadequate for the volume of traffic Ford proposed. At the time, air traffic control consisted of flight numbers, altitudes and headings written on little slips of paper and placed in a case. Quite possibly computerized traffic control, or some form of directional allocation by altitude could resolve the problems. Other problems would also need to be resolved in some ways, however, including intoxicated drivers or motorists that drive without a license. Furthermore, there would be serious concerns among the public in built up urban areas, that malfunctioning or incorrectly operated flying cars could crash into houses, shopping districts or pedestrian areas, severely damaging buildings or killing civilians. Fulton Airphibian - 1946, one example in Canada Aviation Museum. AVE Mizar - 1973, Cessna Skymaster/Ford Pinto hybrid. Crashed, killing developer. Roadable Times web site details many more. There is an active movement in the search for a practical flying car. Several conventions are held yearly to discuss and review current flying car projects. Two notable events are the Flying Car forum held at the world-famous EAA Airventure at Oshkosh, Wisconsin, and the Society of Automotive Engineers (SAE) conventions held at various cities. Flying cars fall into one of two styles; integrated (all the pieces can be carried in the vehicle), or modular (the pieces to fly are left at the airport when the vehicle is driven). A number of companies are developing vehicles. Few have demonstrated a full-sized vehicle capable of free flight. The Parajet Skycar utilises a paramotor for propulsion and a parafoil for lift. The main body consists of a modified dune buggy. It has a top speed of 80 mph and a maximum range of 180 miles in flight. On the ground it has a top speed of 112 mph and a maximum range of 249 miles. Parajet flew and drove its prototype from London to Timbuktu in January 2009. The company intends to produce a commercial version which would cost £50,000. Terrafugia, a private company founded by MIT graduates, is developing the Transition, a roadable aircraft that the company describes as a "Personal Air Vehicle". The aircraft can fold its wings in 30 seconds and drive the front wheels, enabling it to operate as a traditional road vehicle and as a general aviation aeroplane. The Transition "Personal Air Vehicle" is expected to be released to customers in late 2011. An operational prototype was displayed at Oshkosh in 2008 and its first flight occurred on 2009-03-05. The estimated purchase price is $194,000. Owners will drive the car from their garage to an airport where they will then be able to fly within a range of 100 mi (160 km) to 500 mi (800 km). It will carry two people plus luggage and its Rotax 912S engine operates on a single tank of premium unleaded gas. StrongMobile's Magic Dragon Aircar has been developed by retired Air Force pilot-engineer Rich Strong over a 50-year period. The design uses an automobile-type lifting body fuselage and automotive suspension. Flight propulsion uses a front-mounted ducted fan with side outlets. Automatic conversion uses a combination of folding and swinging to stow the wings into the body. The current design envisions a core market of frequent regional business travellers whose time savings make using the StrongMobile virtually revenue neutral. LaBiche Aerospace's LaBiche FSC-1 is a developmental prototype Flying Car and is an example of a practical flying car capable of utilizing today's automotive and aviation infrastructure to provide true "door-to-door" travel. The vehicle can be parked in any garage or parking space available for cars. The FSC-1 is the first known vehicle capable of automatic conversion from aircraft to car at the touch of a button. LaBiche has flown a 1/10th scale model, tested a ¼-scale model and is currently finishing the FSC-1 prototype for road and air testing, as of 2006. Currently, the FSC-1 requires a pilot and driver's license to operate. However, upon approval from the FAA, development is underway for utilizing a new satellite-navigation "hands free" flight system to travel from airport to airport that will eliminate the need for a pilot's license. Numerous safety systems and fail safes are also employed on the FSC-1, such as a recovery parachute. The Haynes Aero Skyblazer is a development stage vehicle that uses a single turbofan engine to provide thrust in the air and to generate electricity to power electric motors for ground travel. In "car mode", a patented mechanism allows the wings to fold into the body of the vehicle, which is designed to fit into a single car garage and regular parking space. In "aircraft mode" the vehicle will have STOL capabilities and be able to use almost any public use airfield. It is expected to have a top speed of 400 mph (640 km/h) and a range of 830 miles (1,340 km). The skyblazer team has completed wind tunnel, stability and control testing and flown a 1/6th scale model. The Milner AirCar is an advanced composite four-door, four-passenger roadable aircraft (flying car) with foldable main wing at the rear and foldable canard in the front. The AirCar has a wingspan of 28 ft (8.5 m), maximum gross weight of 3,000 lb (1,400 kg) and a total of 300 hp (220 kW) from dual ducted fans. Cruise airspeed and range are expected to be 200 mph (322 km/h) for 1,000 miles (1,600 km). After landing the wings fold to a width of 7 ft (2.1 m) so the vehicle can drive on public roads. A drive-able, but non-flyable prototype is complete. The Moller Skycar M400 is a prototype personal VTOL (vertical take-off and landing) aircraft that some refer to as a flying car, although it cannot be driven as an automobile. However, the Skycar is a good demonstration of the technological barriers to developing the VTOL flying car. Moller International continues to develop the Skycar M400, which is powered by four pairs of in-tandem Wankel rotary engines, and is approaching the problems of satellite-navigation, incorporated in the proposed Small Aircraft Transportation System. Moller also advises that, currently, the Skycar would only be allowed to fly from airports & heliports. Moller has been developing VTOL craft since the late 1960s, but no Moller vehicle has ever achieved free flight out of ground effect. The proposed Autovolantor model has an all-electric version powered by Altairnano batteries. Urban Aeronautics' X-Hawk is a VTOL aircraft which operates much like a tandem rotor helicopter, however it doesn't have the exposed rotors which make helicopters dangerous for personal use. This is accomplished by containing the rotors in large 'ducts' which make up most of the body of the craft; the requisite decrease in rotor size also decreases fuel efficiency. The X-Hawk is being promoted for rescue and utility functions. It is expected to be available for about $3 million around 2010. MACRO Industries - SkyRider is a prototype of a flying car developed by MACRO Industries, Inc. Lighter than the Moller Skycar. MotoPOD LLC, advocates the combined use of airplanes and motorcycles to achieve door-to-door transportation. The company has developed a Motorcycle Pod that allows pilots to carry a street-legal motorcycle beneath their airplane. After landing, it takes only a few minutes to remove the motorcycle, unfold the handlebars and ride away. The company believes this modular solution will appeal to pilots who currently enjoy airplanes and motorcycles separately. PAL-V Europe BV: the PAL-V ONE is a hybrid of a gyrocopter with a car. It has 3 wheels and a top speed of 200 km/h (124 mph) on land and air. It can run on petrol, biodisel or bio-ethanol and will cost $US75 000. The vehicle has a very short take of and vertical landing capability. At less than 70 decibels it is quieter than a helicopter due to the slower rotation of the main rotor. The PAL-V ONE has one seat. The Wolff AeroCycle. is a motorcycle that can have the airplane parts attached in order to fly, and then detached to drive on the road. The SkyBike, by SAMSON MOTORWORKS LLC is a three-wheel concept with telescoping wings. First introduced at AirVenture 2008, the SkyBike is to utilize a single Wankel rotary engine and ducted fan to keep the propeller out of harms way on the ground. The wheels and propeller are to be powered by the same engine, but wheel-power only to be utilized on the ground. Development is ongoing at Swift Engineering of San Clemente, with flying prototype targeted for 2009. A predicted top speed of 110 mph on the ground is nearly as fast as the anticipated 130 mph in the air. No parts are left at the airport after conversion from aircraft to ground vehicle, as the main wing and tail retract into the vehicle body. The vehicle leans into the turns on the ground, to impart the feeling of being 'flown' on the ground as well.